The first golfing major of the year, the Augusta Masters, began yesterday (Apr 11) and concludes on Sunday (Apr 14). Still the most unique of all the golfing majors, Augusta is slowly making changes to encourage golf. Firstly with its drive, chip and putt for junior golfers that come from all over America through a qualifying system that accumulates at Augusta for the finals. Secondly, Augusta is embracing more changes by adding The Augusta National Women’s Amateur for the top 72 female amateur golfers coming from all over the world. The club admitted its first two female members, Condoleezza Rice and Darla Moore, in August 2012. The first two rounds of this 54 hole tournament are played at a different golf course from Augusta before all the top female golfers play a practice round on the course. After that, the top 30 qualifiers get to play Augusta again, being the last round of the tournament. The winner this year was an American golfer, Jennifer Kupcho, who finished at 10 under par total for the 3 rounds. From the feedback that I receive, the fifth golf hole at Augusta has been changed considerably, however, it’s only one hole out of 18. Among the dos and don’ts as a spectator at Augusta, for professional golfers as well – you are not allowed to lie down on the grass anywhere on the Augusta golf course or surrounding grounds inside Augusta. Are scores getting lower in golf? Remember that only 5% of all golfers that play on the golf course break the score of 100. Considering golf equipment has improved and generally is more expensive, the average score at the Masters has been only 11.6 under par for the last 10 years. Augusta has four par 5s all reachable in two that would give the pros an automatic 12 under par for four rounds of golf (72 holes). So why is the average winning score only 11.6 under par? begs the question. Why haven’t golf scores become lower? In essence, golf is not an easy game to play. Top pros are working on their game all the time, normally with a golf coach, to improve technique, touch, feel and many other elements, not including how much they practice on and off the golf course. Buying the latest driver, putter or completely new set of golf clubs isn’t necessarily going to improve a golfer’s game. These new purchases of golf equipment could feel better, but are they going to help you play better golf? It might be a good investment to go to a good golf coach/teacher to find out how to use the golf clubs you have already, getting the best out of your putting, chipping, pitching, bunker, second shots and tee shots, probably lowering your golf score at the same time. 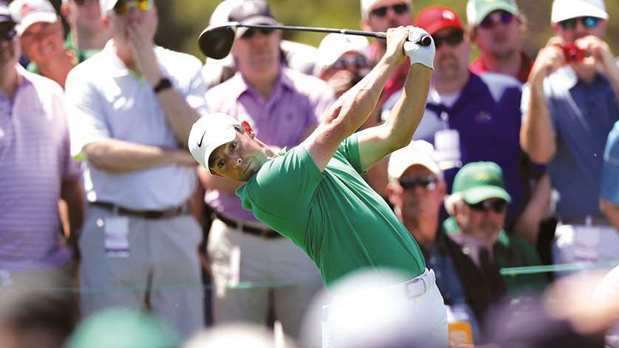 The favourite to win the Masters this year is Rory McIlroy from Northern Ireland. Before Rory tees it up each year, he receives a cheque from Nike Golf of US$50 million – a deal over ten years (plus all the other sponsors he has to boot). Golf fans will only remember the best golfers if they become a golfing legend. All top pros, to prove their worth, must win Major Championships. After winning the Players Championship this year, Rory could seal the deal to become only the sixth golfer in the modern era to win all four Majors, which will be no mean feat. Good luck Rory! Over the next four months, we will have a Majors a month. After Augusta in April, the PGA Championship is in May. In June is the US Open, finishing up in July with the (British) Open Championship.